ESL/Rochester Regional Health 2017-2018 Wilson Stage Series kicks off with Lin-Manuel Miranda’s first Tony Award-winning musical. Geva Theatre Center presents In the Heights, with music and lyrics by Lin-Manuel Miranda, book by Quiara Alegría Hudes, conceived by Lin-Manuel Miranda and directed by Melissa Rain Anderson in the Elaine P. Wilson Stage from September 5 through October 8. In ‘the Heights,’ life is always colorful and everybody knows everyone. Here, coffee from the corner bodega is sweet and the air is filled with the sounds of salsa, merengue, soul, hip-hop and R & B. But it’s a neighborhood on the cusp of change, where the biggest decisions can be choosing which traditions you keep and which ones you leave behind. This landmark musical by the creator of Hamilton was the winner of 4 Tony Awards (including Best Musical and Best Original Score) and a Pulitzer Prize-nominee. Lin-Manuel Miranda wrote the first draft of In the Heights in 1999, during his sophomore year at Wesleyan University. It was produced by the Wesleyan’s student theatre company, Second Stage, in April 2000. After seeing it, seniors and an alumnus asked Miranda if he could write a more expanded version with a view to conquering Broadway. After five separate drafts, Quiara Alegría Hudes joined the team in 2004. The revised version premiered at the National Music Theater Conference at the Eugene O’Neill Center in 2005. In February 2007, it opened Off-Broadway and was nominated for nine Drama Desk Awards (winning two) and won the Outer Critics Circle Award for Outstanding Musical. A year later, it opened on Broadway at the Richard Rodgers Theatre (where Hamilton is currently playing) and recouped it $10 million dollar investment in only ten months. The Broadway production closed in January 2011 after 29 previews, 1,184 performances, four Tony Awards, two Drama Desk Awards and a Pulitzer Prize nomination. In the Heights embarked on a national tour in October 2009 and was the first Equity tour to play in San Juan, Puerto Rico. It has subsequently been performed in the Philippines, Panama, Brazil, UK, Japan, Australia, Canada, South Korea and Peru. Making their Geva debuts in In the Heights are Yassmin Alers (Broadway productions of On Your Feet, The Rocky Horror Show and Rent) as Abuela Claudia; Xavier Cano (Broadway productions of Grease and Rent) as Usnavi; Tony Chiroldes (original Broadway cast of In the Heights) as Kevin; Sidney Dupont (Broadway production of Beautiful: The Carole King Musical and national tours of Memphis, Beautiful and A Chorus Line) as Benny; Natalie Gallo (Broadway productions and national tours of Mamma Mia! and Jersey Boys) as Carla; Buffalo native Alejandro Gomez as Sonny; Donnie Hammond (regional productions of In the Heights, Ghost the Musical and Rent) as Daniela; Rochester Latino Theatre Company member Mary Méndez Rizzo as Camilla; Jeffrey Nuñez (national tour of In the Heights) as the Piragua Guy; Mia Pinero (My Fair Lady at Playmakers Rep, West Side Story at Ivoryton Theatre) as Nina; Alex Swift (national tour of The Wizard of Oz) as Graffiti Pete and Chiara Trentalange (Anything Goes at Goodspeed Opera House; A Chorus Line at Interlakes Summer Theatre; Grease at Forestburgh Playhouse and Grease at Maine State Music Theatre) as Vanessa. The ensemble features Cameron Burke (national tours of Matilda the Musical and In the Heights); Amanda Castro (who also serves and Assistant to the Choreographer and Dance Captain); Nico DeJesus (national tour and filmed version of Disney’s Newsies); Grace Hardin (Young Frankenstein at MUNY, Legally Blonde at Sacramento Music Circus); Tramaine Montell Ford (national and international tours of Dreamgirls, international tour of Elton John and Tim Rice’s Aida); Adriana Scalice (Geva productions of A Christmas Carol and The Music Man) and Carlita Victoria (regional productions of The Color Purple, Dreamgirls, Aladdin and Hairspray). In the Heights is directed by Melissa Rain Anderson (last season’s opening production of A Funny Thing Happened on the Way to the Forum, the 2015 sell-out hit production of Monty Python’s Spamalot and 2014’s The 25th Annual Putnam County Spelling Bee) with musical direction by Don Kot and choreography by Julio Augustin. The design team includes Adam Koch (scenic design), Kara Harmon (costume design), Brian J. Lilienthal (lighting design) and Danny Erdberg (sound design). Geva thanks their community partner for In the Heights, Rochester Latino Theatre Company. Founded in 2011, Rochester Latino Theatre Company raises awareness of the Latino experience through bilingual theatrical performances and workshops. They celebrate, promote and support emerging and established Latino theatre artists and contribute to the diversity of the American Theatre by bringing forth the voice of the Latino American experience and identity. The 2017-2018 Wilson Stage Series is sponsored by ESL Federal Credit Union and Rochester Regional Health. The Honorary Wilson Stage Series Sponsor is Dr. Dawn Lipson. 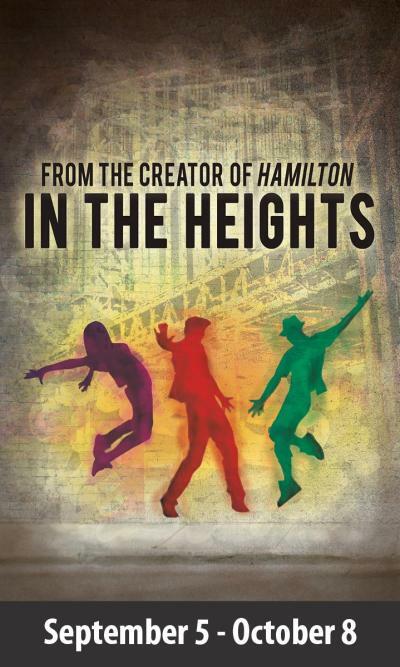 In the Heights is produced with support from the Scale the Heights Producing Group; Lead Co-Producer Buckingham Properties; Co-Producer Harter Secrest & Emery LLP; and Media Sponsors Fox TV, WDKX and WXXI. In the Heights begins previews on September 5, opens September 9 and runs through October 8. Dawn Kellogg, Communications Manager, (585) 420-2059. Ticket Prices: Tickets start at $25. * Partial support for open captioning provided by Theatre Development Fund. Founded in 1972, Geva Theatre Center is a not-for-profit, professional theatre company dedicated to creating and producing professional theatre productions, programs and services of a national standard. 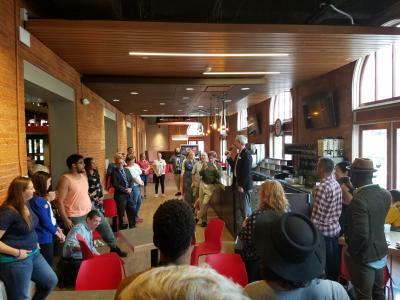 As Rochester’s leading professional theatre, Geva Theatre Center is the most attended regional theatre in New York State, and one of the 25 most subscribed in the country, serving up to 160,000 patrons annually, including more than 16,000 students. The 522-seat Elaine P. Wilson Stage is home to a wide variety of performances, from musicals to American and world classics. The 180-seat Ron & Donna Fielding Stage is home to Geva’s own series of contemporary drama, comedy and musical theatre; Geva Comedy Improv; Geva’s New Play Reading Series and the Hornets’ Nest - an innovative play-reading series facilitating community-wide discussion on controversial topics. In addition, the Fielding Stage hosts visiting companies of both local and international renown. Geva Theatre Center offers a wide variety of educational, outreach and literary programs, nurturing audiences and artists alike. Since 1995, the organization has been under the artistic direction of Mark Cuddy.